HOFFMAN ESTATES, Ill. — Sophomores Austin DeSanto and Alex Marinelli won individual titles to help Iowa capture the team race at the 56th Ken Kraft Midlands Championships on Sunday inside the Sears Centre Arena. 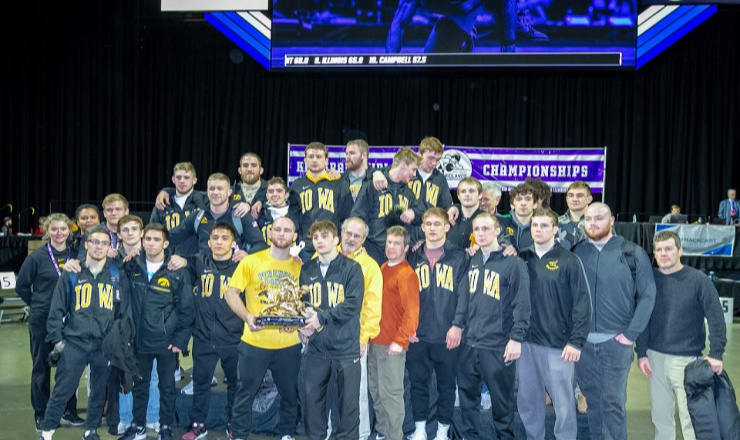 Iowa scored 184 points to win its 28th Midlands title, 10 of which have been led by head coach Tom Brands. Northern Iowa followed the Hawkeyes with 119.5 points, Northwestern came in third with 110 points and Wisconsin followed in third with 97.5 points. The second-seeded DeSanto grabbed his first Midlands title, winning the 133-pound bracket with a convincing 15-5 major decision over the fourth seed. DeSanto scores 28.5 team points in the tournament. Second-seeded Alex Marinelli earned his second Midlands title in as many seasons, defeating the No. 1 seed Evan Wick, 4-3. Spencer Lee, Max Murin, Kaleb Young, and Cash Wilcke placed second in the 125, 141, 157, and 184-pound brackets. No. 5 Pat Lugo and Jeren Glosser placed fourth in the 149 and 157-pound brackets, while Paul Glynn and No. 2 Jacob Warner placed fifth at 133 and 197 pounds. The Hawkeyes return to the mat on Jan. 13, in Minneapolis, Minnesota against Minnesota at 12 pm (CT).